GBA Metroid: Zero Mission (USA) "100%" in 1:01:08.0 by cpadolf. 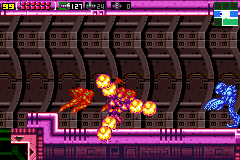 Samus's first adventure is retold in Metroid: Zero Mission with extra storyline, extra items and on a system with a better graphics processor. This run completes the game with 100% item collection. At least as far as the end-of-game display is concerned. This is an improvement of 35.70 seconds, over Dragonfangs's previous movie. The improvements come mainly from greater optimization in movement and better ammo management. Unlike the previous author, Cpadolf aimed for lowest real time, finishing the game in 42:07 on the in-game timer.